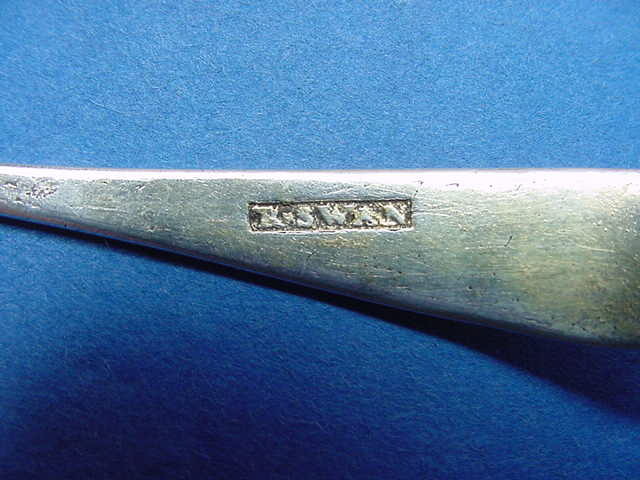 This page will concentrate on Civil War era and earlier silver servers with the exception of the Coin Silver Ladles and Coin Silver Sugar Tongs which will be listed separately. Pre-1850 Servers usually are simple in form and limited in type; in general it was not until the third quarter of the 19th century that the number of serving types began to proliferate so unusual forms usually date from this period. Some of these (including pattern examples) will be also listed with the larger listings of later and more varied servers which will be broken down into six different sections and found on the following pages: Serving Spoons (those with a bowl), Serving Forks (those with tines), Serving Knives (those with blades), Serving Sets (combinations of servers or serving and place pieces), Ladles (bowls again! ), and Miscellaneous Servers (everything else!). Identifying the original use of a server can sometimes be difficult, especially if one does not have the manufacturer's catalog. As a consequence we may have just what you need listed under a completely different category than what you might expect. Thus it is hoped that having a separate page for these six broad groupings of servers will enable you to search through somewhat similar categories that may more quickly yield what you are looking for. These sections will include post-Civil War American Servers and foreign examples of any age. 1454-08. 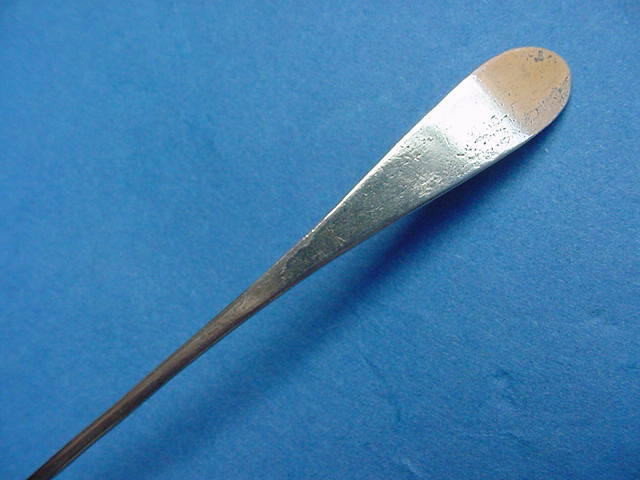 Antique American Silver Butter Knife with the hollow handle in the 'Oval Thread' pattern ending in a short curved blade; made by Albert Coles of New York NY, c.1850-1875. 7.18" long, 0.75" blade width, 1.25 troy oz. gross. Some dings including tip blade. Script mono "MSM" on the handle. $ 25. 1482-27. 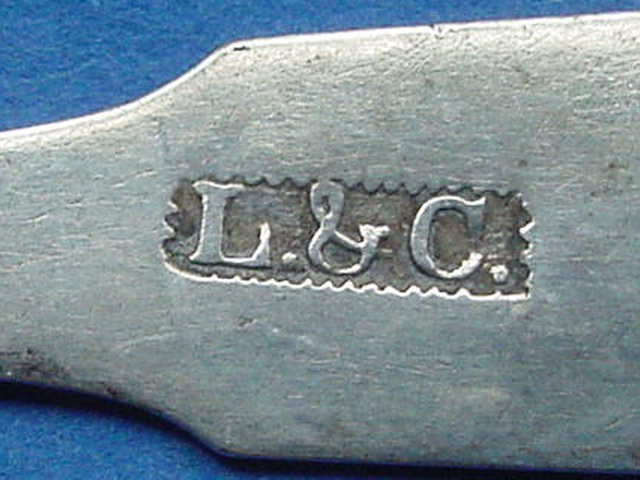 Antique American Silver Butter Knife with the hollow handle in a 'Kings' style pattern ending in a short curved blade; marked by the unidentified [H.D] and struck with "bust-lion-F" manufacturing trademarks probably used by an unknown New York NY manufacturer c.1845-1860. 7.18" long, 0.75" blade width, 1.45 troy oz. gross. Script mono "HFH" on handle. $ 30. 1560-53. 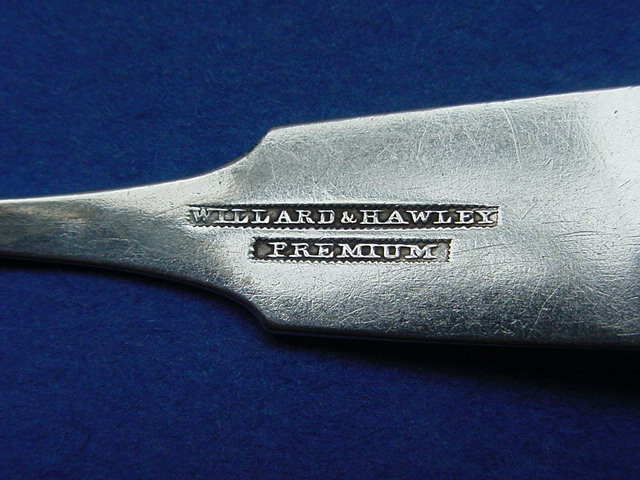 Antique American Silver Butter Knife in the 'Grape' pattern (1850) with engraved foliate scroll decorated blade; retailed by Gould, Stowell & Ward of Baltimore MD, working 1855-1858. 7.5" long, 1.1" blade width, 1.2 troy oz. Some surface wear. Script mono "H". $ 60. 1559-39. 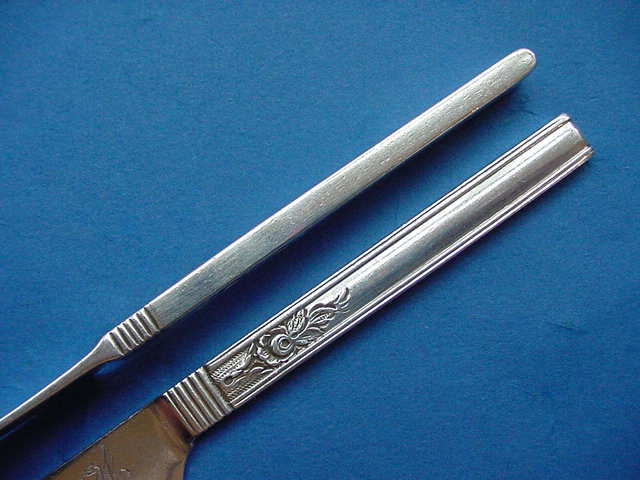 Antique American Silver Butter Knife in an unidentified scrill & thread fancy pattern marked <F.&H> by Farrington & Hunnewell of Boston MA, c.1850-1865. 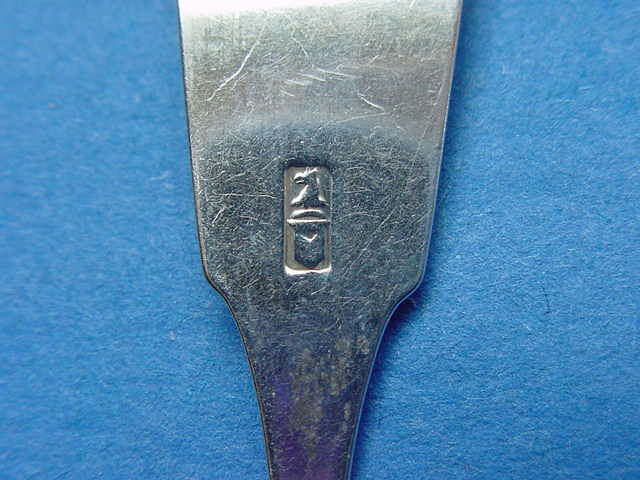 7.55" long, 1.1" boade width, 1.2 troy oz. Some surface wear, small ding at end of blade. No mono. $ 40. 1558-11. 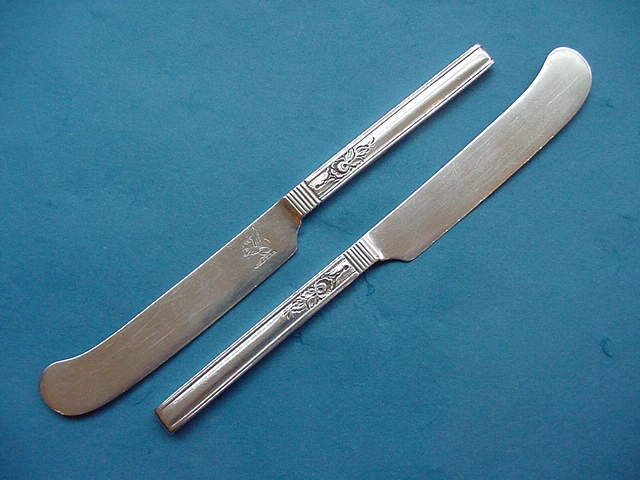 2 Antique American Silver Butter Knives with the solid rectangular handle in a 'Threaded Chased' pattern ending a curved blade; marked by Samuel Kirk of Baltimore MD, c.1835-1846. 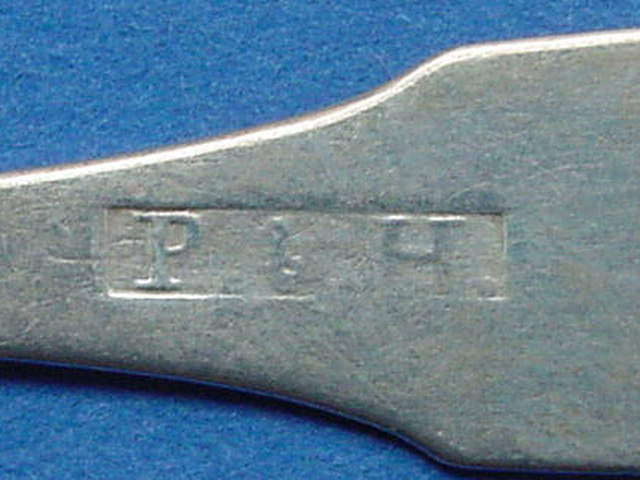 7.5" long, 0.68" balde width, handle 0.35" wide and 0.18" thick, approximately 2.0 troy oz. each. 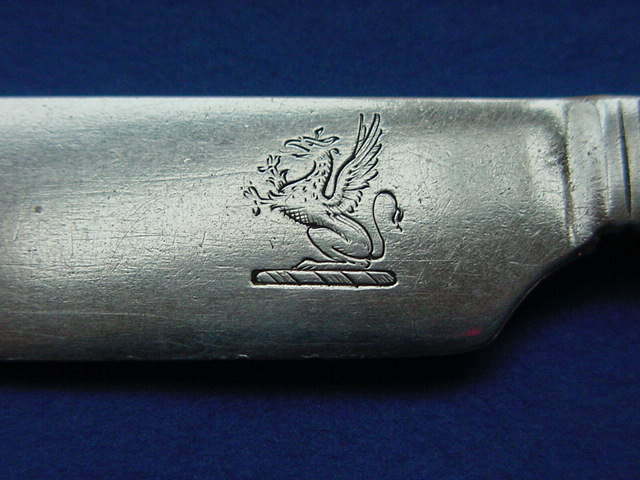 Engraved Griffin crest of the Albert family. $ 100./ea. 1556-47. 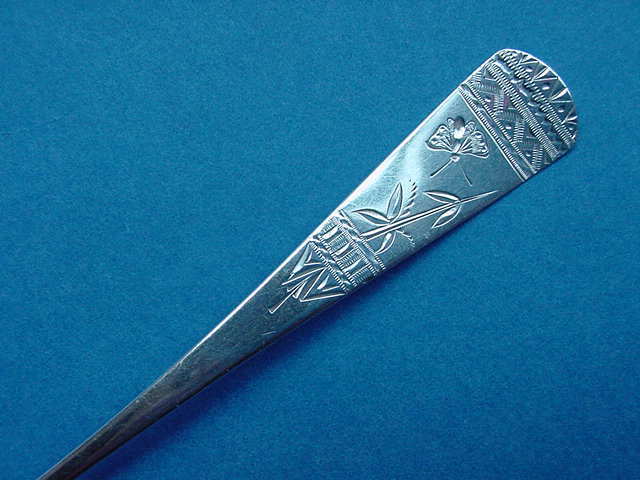 Antique American Silver Butter Knife in an "Antique Engraved' pattern with floral engraved perpendicular curved blade; unmarked c.1860-1870. 7.1" long, 0.88" blade width, 0.75" handle width, 0.75 troy oz. Some surface wear. No mono. $ 35. 1535-06. Antique American Silver Fish Slice in a 'Knot' pattern with engraved foliate scroll and vine decorated blade; marked by Newell Harding & Co. of Boston MA, c.1850-1870. 10.62" long, 2.5" blade width, 2.9 troy oz. Mono "M" within a wreath. $ 195. 1564-35. Antique American Silver Crumber in an 'Antique Engraved' pattern with engraved engine-turned and foliate scroll decorated blade; marked by Peter L. Krider of Philadelphia PA c.1860-1870. 11.0" long, 2.25" blade width, 2.85 troy oz. Engraved script mono "TBH". $ 170. 1574-02. 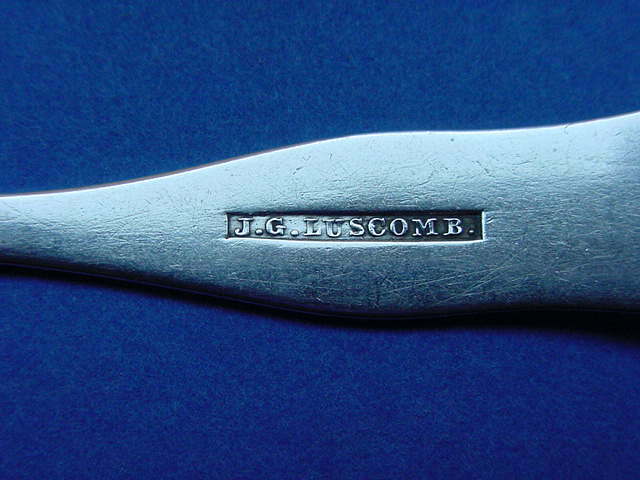 Antique American Silver Mustard Spoon in the 'Fiddle' pattern marked [BRINSMAID'S] with manufacturer's trademarks "B-honey bee-D" for either Brinsmaid & Bros. working 1845-1850 or their successor Brinsmaid, Bro. & Co. working 1850-1854. 4.6" long, 0.88" bowl diameter, 0.25 troy oz. Script mono "W". $ 45. 1448-43. 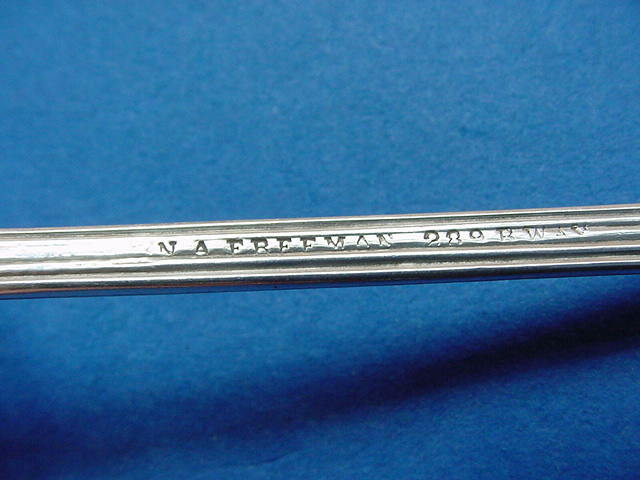 Antique American Silver Mustard Spoon in the double struck 'Fiddle Thread' pattern; marked by Norman A. Freeman of New York NY c.1850. 5.12" long, 0.88" bowl width. Mono probably erased from front of handle. $ 60. 1530-26. 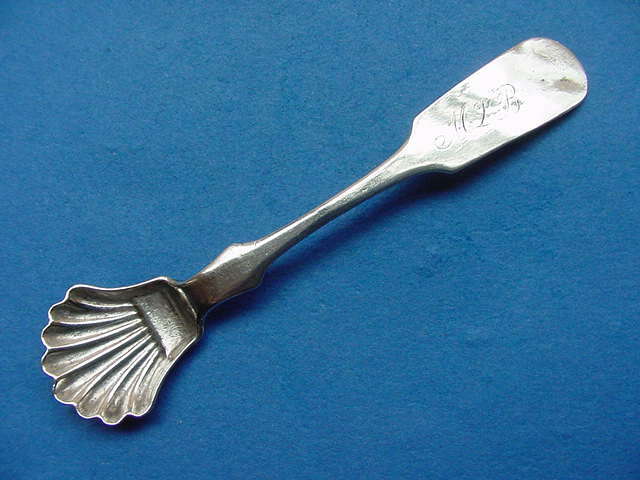 Antique American Silver Mustard Spoon in the 'Wavy Fiddle' pattern marked by John O. Holden of Quincy MA, c.1855-70. 5.25" long, 0.88" bowl width. Script mono "S.S." $ 30. 1403-32. 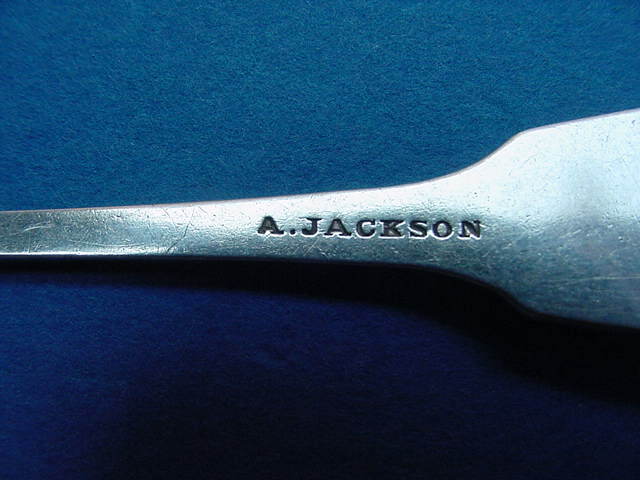 Antique American Silver Mustard Spoon in the 'Fiddle' pattern marked by A. Jackson of Norwalk CT, c.1845-1870. (An Andrew Jackson is also recorded in Eau Claire WI in 1867.) 5.5" long, o.88" bowl width. Upper handle a little wavy. 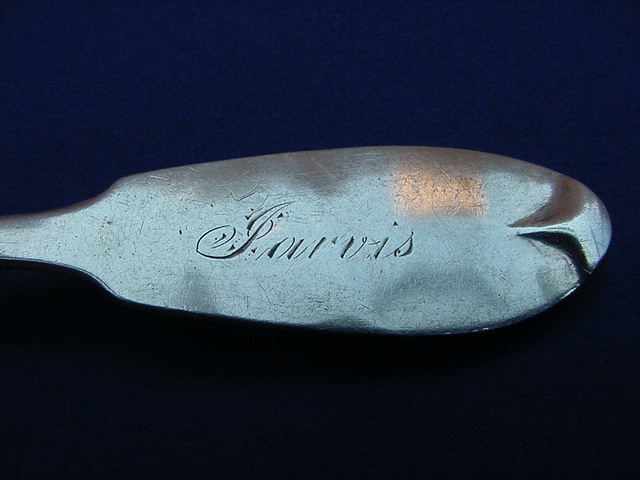 Script engraved "Jarvis". $ 40. 1510-20. 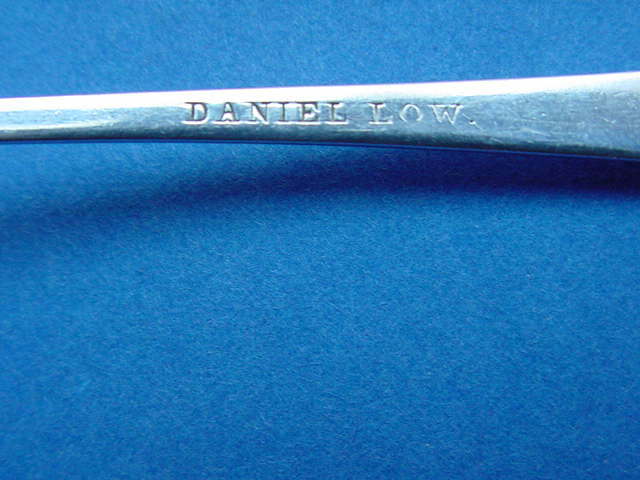 Antique American Silver Mustard Spoon in an 'Aesthetic Engraved' pattern with lobed ovoid bowl; marked by Daniel Low of Salem MA, c.1875-1885. 5.25" long, 0.75" bowl width. Mono "A". $ 45. 1510-19. Antique American Silver Mustard Spoon in the 'Wavy Fiddle' pattern marked by John G. Luscomb of Salem MA, c.1860-1875. 5.12" long,0.88" bowl width. Mono "SAA". $ 35. 1553-11. Antique American Silver Mustard Spoon in the 'Fiddle' pattern with ovoid bowl; marked by Levin Mannerback of Reading PA, c.1840-1860. 5.75" long, 0.75" bowl width, 0.4 troy oz. Script mono "MWO". $ 75. 1530-25. 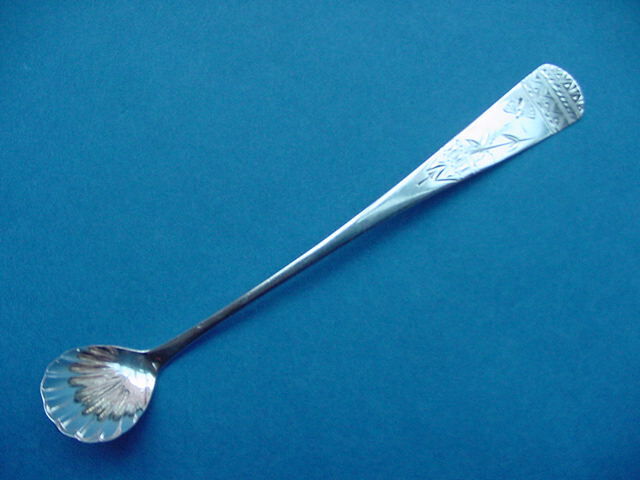 Antique American Silver Mustard Spoon in the 'Wavy Fiddle' pattern marked by A. Stowell of Boson MA, c.1850-1860. 5.12" long, 0.94" bowl width. No mono. $ 30. 1483-07. 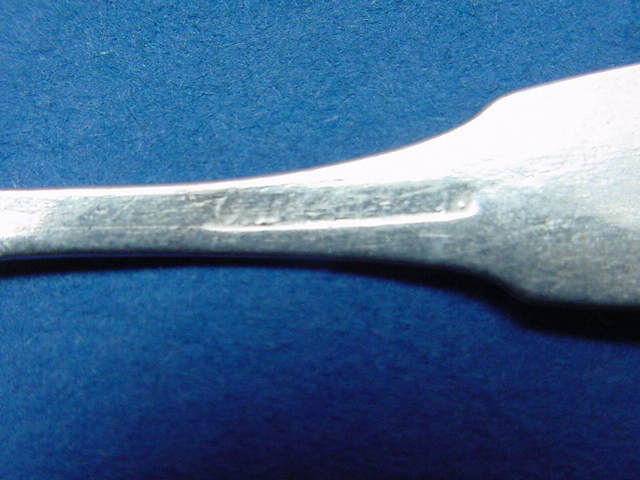 Antique American Silver Mustard Spoon in the 'Antique' pattern marked by Robert Swan of Philadelphia PA, c.1790-1805. 5.0" long, 0.88 bowl diameter. The original handle gilding is mostly worn away with some surface corrosion, bowl with new gilding. No mono. $ 60. 1488-54. Antique American Silver Mustard Spoon in the 'Fiddle' pattern marked by Willard & Hawley of Syracuse NY, c.1845-1860. 5.0" long, 1.0" bowl width. 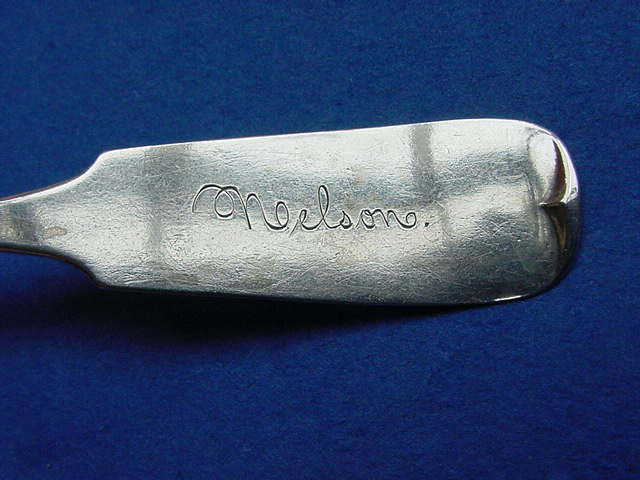 Engraved "Nelson". $ 40. 1406-61. 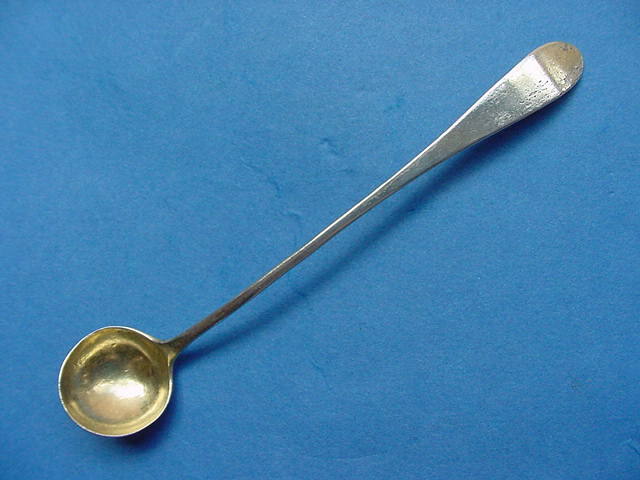 Antique American Silver Mustard Spoon in the 'Finless Fiddle' pattern with ovoid bowl; made by Robert & William Wilson of Philadelphia PA, c.1825-1835. 5.44" long, 0.75" bowl width. Mono "RMH". $ 70. 1351-05. 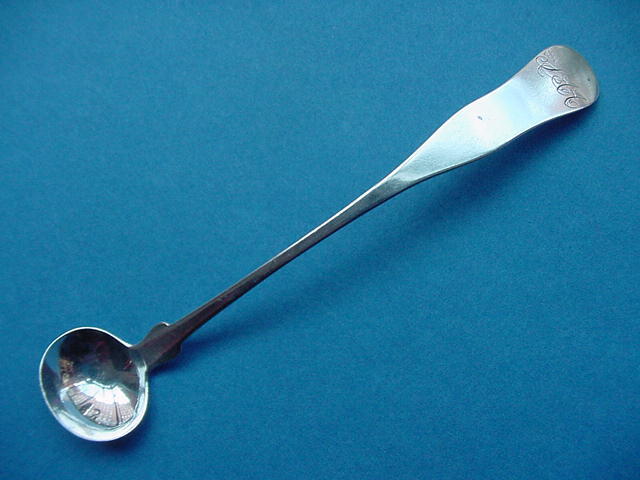 Antique American Silver Mustard Spoon in the 'Fiddle' pattern marked by Eleazer Wyer Jr. of Portland ME, c.1810-1848. 4.56" long, 0.81" bowl width. Mono "EF". $ 60. 1566-14. Pair Antique American Silver Salt Spoons in the 'Fiddle' pattern marked [B&T] for either John Bennett & Ebenezer Thomas of Petersburg VA working 1812-1819 or their successors John Bennett & John W. Thomas working 1819-1828. $ 125. 4.12" long, 0.65" bowl width, 0.35 troy oz. Worn surface, one shovel bowl damaged. Worn foliate script mono "CWB". $ 125. 1484-39. 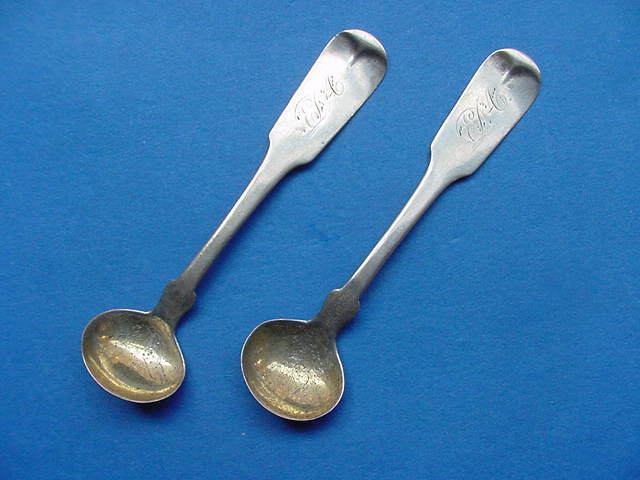 Pair Antique American Silver Salt Spoons in the engraved 'Mayflower' pattern marked by Canfield, Bro. & Co. of Baltimore MD, working 1847-1881. 3.5" long, 0.95" bowl width, 0.55 troy oz. No mono. $ 55. 0685-24. 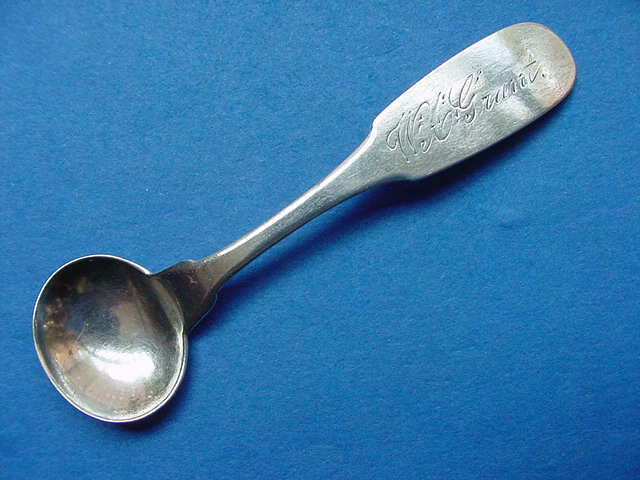 Antique American Silver Salt Spoon in the 'Wavy Fiddle' pattern marked by Carter & Whitford of Concord NH, w.1855-1859. 3.62" long, 0.94" bowl width. Mono "LMM". $ 23. 1448-51. 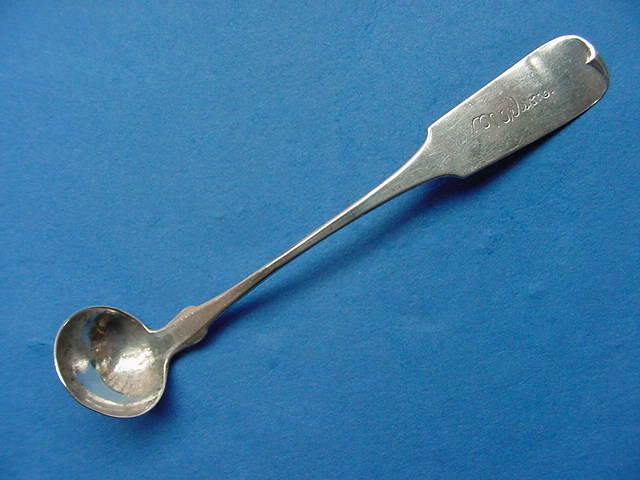 Antique American Silver Salt Spoon in the 'Fiddle' pattern marked by Oliver B. Cooley of Utica NY, working 1828-1844. 3.88" long, 0.88" bowl width. Engraved "W.A.Grant". $ 28. 1495-08. 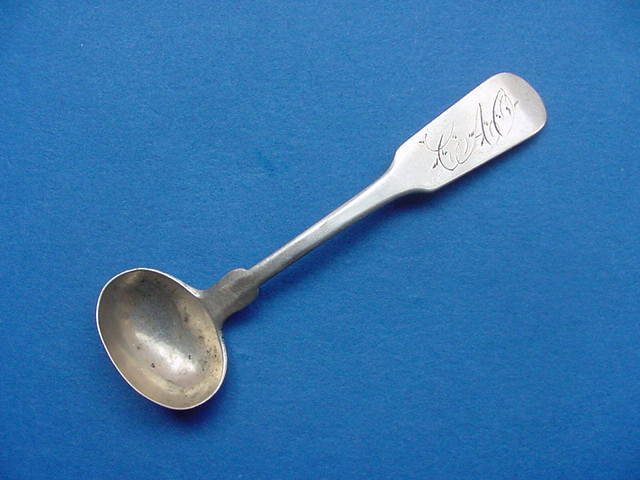 Antique American Silver Salt Spoon in the 'Fiddle' pattern with shovel bowl; worn mark of Levi Drummond of Baltimore MD, working 1842-1867. 4.2" long, 0.75" bowl width, 0.2 troy oz. Back of handle scratched, stress bend in handle. No mono. $ 15. 1567-31. Pair Antique American Silver Salt Spoons in the 'Fiddle Thread' pattern marked by Charles Gennet of Richmond VA, c.1850-1870. 3.5" long, 0.95" bowl width, 0.65 troy oz. Feathered script mono "GWN" for George Washington Nicholas. $ 80. 1132-13. 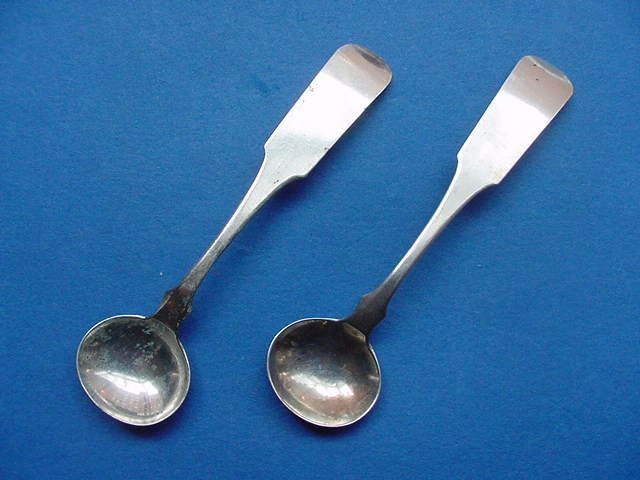 Pair Antique American Silver Salt Spoons in the 'Fiddle' pattern marked by H. Hastings, c.1845-1864. 3.75" long, 0.94" bowl width. Scratches and losses to gilding of bowls. Mono "EDA". $ 40. 1488-51. 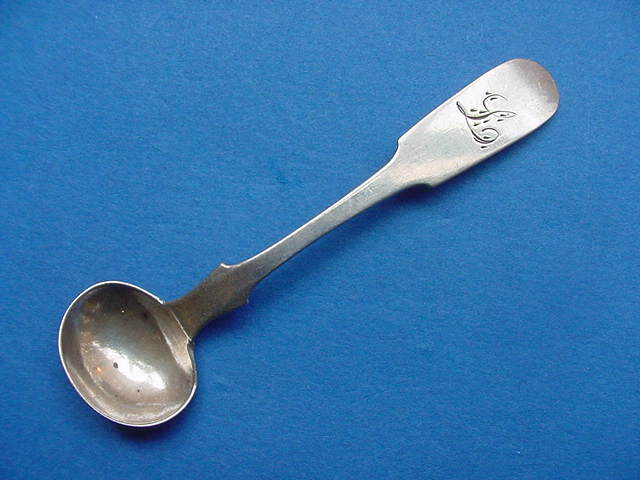 Antique American Silver Salt Spoon in the 'Fiddle' pattern with scallop shell style bowl; marked by the unlocated R. L. Hernicourt, c1840-1860. 3.88" long, 0.88" bowl width. Handle dented. Mono "MLB". $ 35. 1526-66. 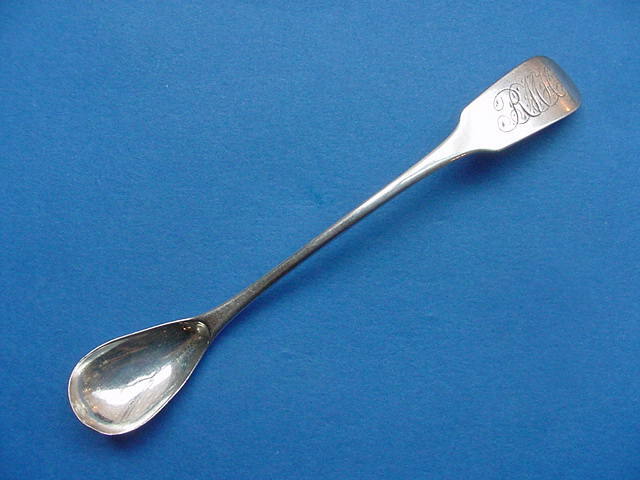 Antique American Silver Salt Spoon in the 'Double Swell Fiddle' pattern made by Samuel Kirk & Son of Baltimore MD, working 1846-1861. 3.85" long, 0.88" bowl width, 0.3 troy oz. Script mono "HL". $ 25. 1535-57. 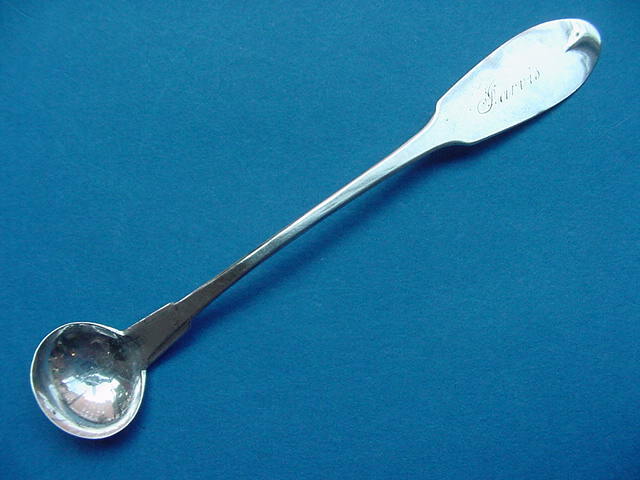 Antique American Silver Salt Spoon in the engraved 'Mayflower' pattern made by Samuel Kirk & Sons of Baltimore MD, working 1861-1868. 3.5" long, 0.9" bowl width, o.25 troy oz. Some scuffing in bowl. Script mono "JKB". $ 35. 1334-55. 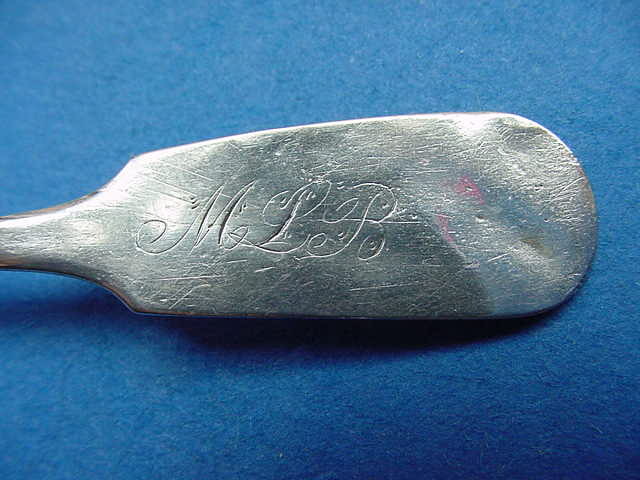 Antique American Silver Salt Spoon in the 'Fiddle' pattern marked by the unidentified [L&C], c.1815-1840. 3.44" long, 0.88" bowl width. Handle with scratches. Mono "H". $ 25. 1347-21. Pair Antique American Silver Salt Spoons in the 'Antique' pattern; marked by Samuel Leonard of Chestertown MD, c.1810-1820. One script mono "W" and the other "M". 3.55" long, 0.7" bowl width, 0.3 troy oz. Surface wear and discoloration, one thin bowl with major hole. $ 125. 1370-33. 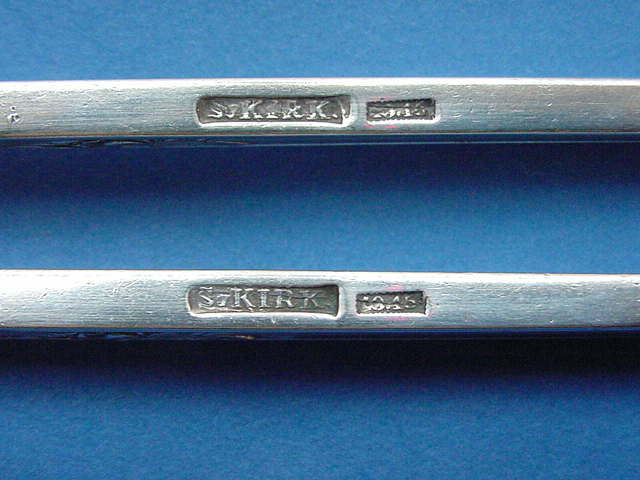 Pair Antique American Silver Salt Spoons in the 'Fiddle' pattern; marked by John J. Low of Boston MA, c.1825-1835. 3.81" long, 1.0" bowl width. No mono. $ 50. 0666-10. 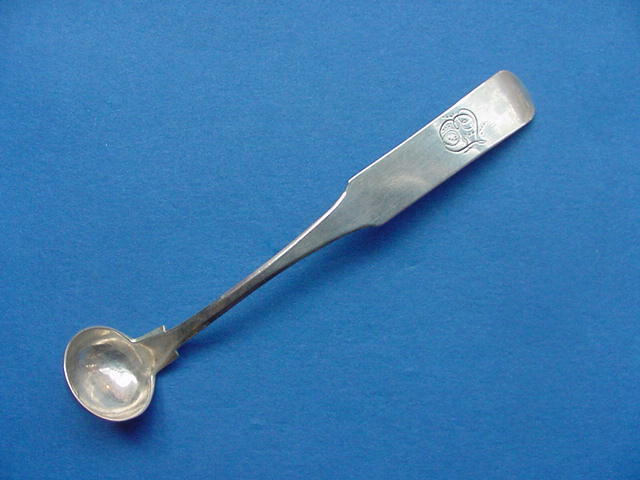 Antique American Silver Salt Spoon in the 'Fiddle' pattern marked by A. Miller, c.1825-1850. 3.81" long, 1.0" bowl width. Mono "L". $ 26. 1059-27. 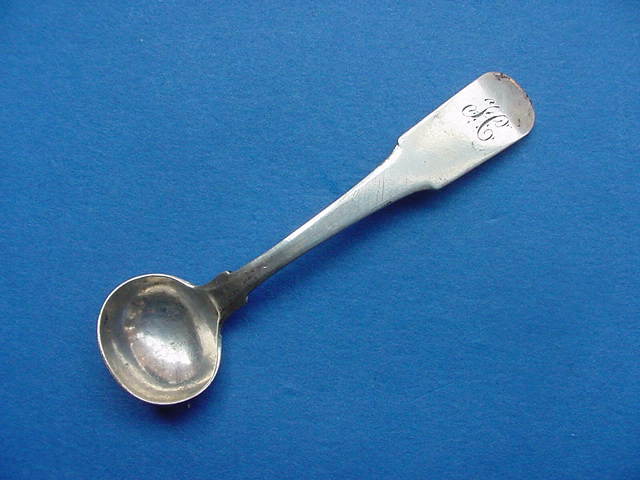 Antique American Silver Salt Spoon in the 'Fiddle' pattern marked by the unidentified [P&H], c.1820-1850. 3.81" long, 0.94" bowl width. Mono "CL". $ 30. 1535-33. 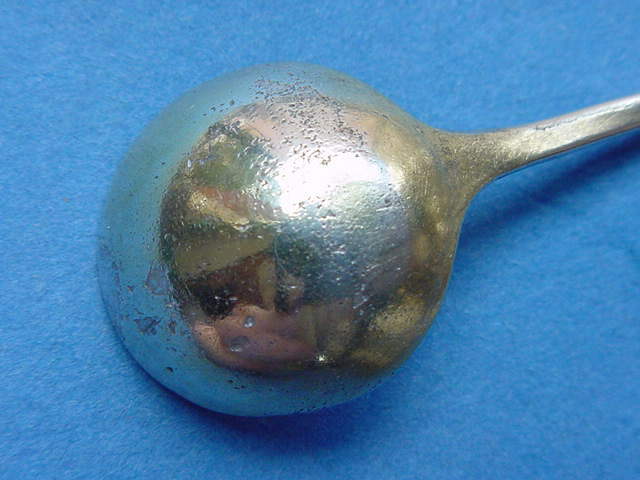 Antique American Silver Salt Spoon in the engraved 'Mayflower' pattern with lobed ovoid gilt bowl; made by Andrew E. Warner of Baltimore MD, c.1850-1875. 4.0" long, 0.65" bowl width, 0.3 troy oz. Wear to gilding on bowl. Old English mono "R". $ 35. 1450-40. 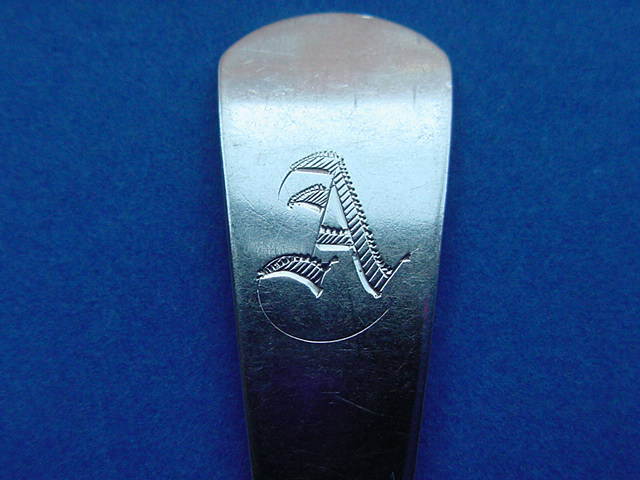 Antique American Silver Salt Spoon in the 'Fiddle' pattern struck with the horse head above chevron trademark used by James Watts of Philadelphia PA, c.1840-1870. 3.75" long, 1.0" bowl width. Mono "JEW". $ 20. 1445-08. 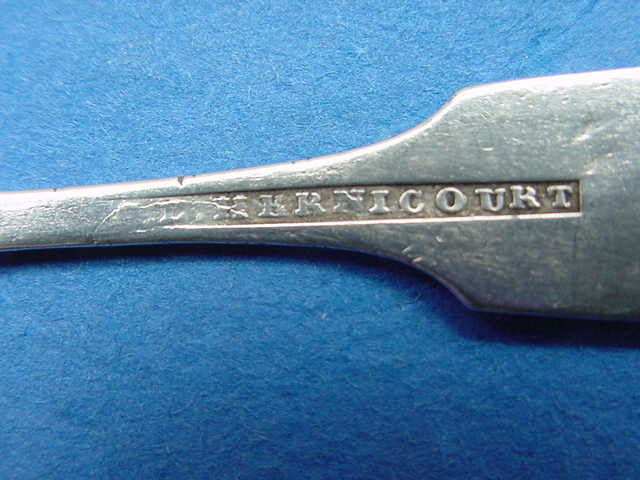 Antique American Silver Salt Spoon in the 'Fiddle' pattern struck with the horse head above chevron manufacturer's trademark used by James Watts OF and retailed by Francis C. Polack of York PA, c.1840-1870. 3.75" long, 1.0" bowl width, 0.2 troy oz. Script mono "M.L." $ 20. 1027-07. 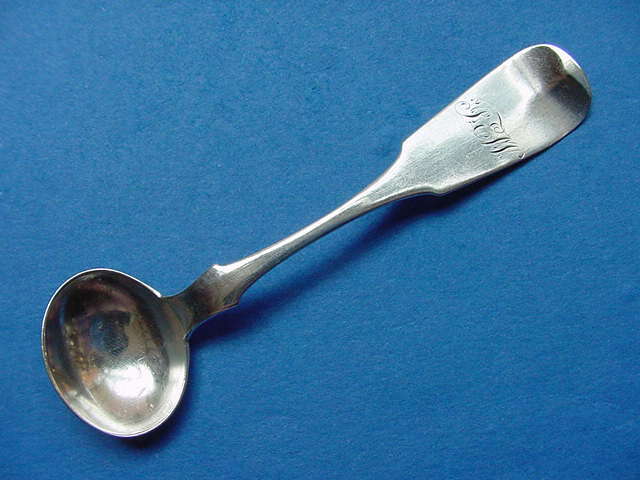 Antique American Silver Salt Spoon in the 'Fiddle' pattern marked by William H. Whitlock of New York NY, w.1805-1827. 3.75" long, 1.12" bowl width. Mono "CAO". $ 20. 1360-09. 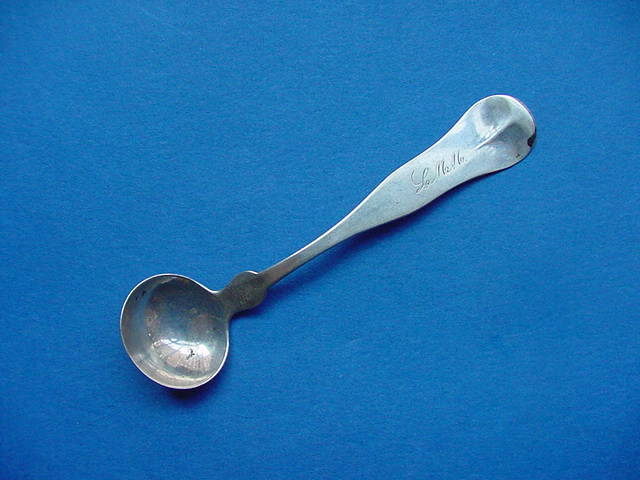 Antique American Silver Salt Spoon in the 'Fiddle' pattern made by R. & W. Wilson of Philadelphia PA, c.1830-1850. 3.62" long, 0.94" bowl width. Worn surface. Mono "L". $ 20. 1596-81. Antique American Silver Sugar Sifter in the 'Wavy Fiddle' pattern with pierced oval bowl; marked BIGELOW, BROS & KENNARD for the Boston MA manufacturer working 1847-1869. 6.1" long, 1.9" bowl width, 0.4" bowl depth, 0.95 troy oz. Script mono "C". $45. 1607-20. Antique American Silver Sugar Sifter in the double-struck 'Kings' pattern with lobed and pierced gilt bowl; struck with the "eagle-thistle-harp" manufacturing trademarks and partial name mark "TAYL..." for Taylor & Lawrie of Philadelphia PA, working independently 1852-1870+. 7.75" long, 2.3" bowl diameter, 0.6" bowl depth, 2.05 troy oz. Gilding on bowl worn. Replacement script mono "A&KL". $85. 1569-10. 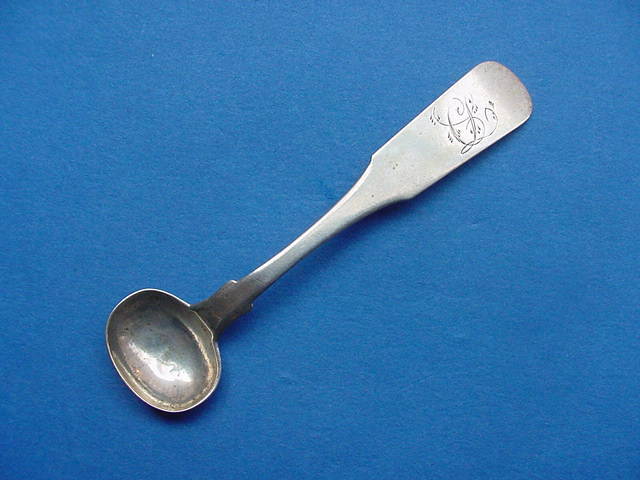 Antique American Silver Sugar Spoon in an 'Antique Engraved' pattern with engraved foliate scroll decorated ovoid bowl; marked "P.L.K." for Peter L. Krider of Philadelphia PA, c.1860-1870. 7.25" long, 1.5" bowl width, 1.2 troy oz. 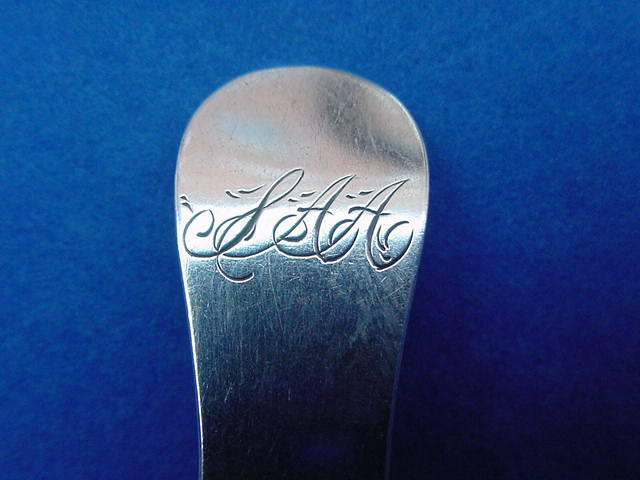 Engraved Old English "Lucy". $ 55.